Those of us who grew up going to Sunday School remember stories about David and Goliath. David was the youngest “little brother” of Jesse’s eight sons, relegated to errand boy status, while his older brothers battled the Philistines as manly soldiers. Twice the writer describes David as “only a boy.” The narrator pictures David as “ruddy and handsome,” hardly the traits of a warrior. When his brothers berated him when he delivered reinforcements to the front lines, he responded plaintively, “Can’t I even speak?” Saul’s armor was so big on him that he couldn’t move. Then, of course, there was his famous slingshot that he wielded to slay the nine-foot Goliath who had “defied the armies of the living God”. The punch line about David and Goliath was something to the effect that God uses insignificant people and unlikely means to accomplish improbable feats. It has been used for generations to open up tiny minds to the majesty and greatness of the Lord’s power. That is certainly true. But there’s one horrifying detail in the story that my Sunday School teacher skipped. David “took hold of the Philistine’s sword and drew it from the scabbard. After he killed him, he cut off his head with the sword”. (a little over the top, don’t you think?) David then displayed Goliath’s head in Jerusalem, brandished it before King Saul, and kept his sword in his tent as a souvenir. By decapitating Goliath, David wanted to “show the whole world that there is a God in Israel. All those gathered here will know that it is not by the sword or spear that the Lord saves; for the battle is the Lord’s, and he will give all of you into our hands”. It was his way of claiming his God as God. It was a testament of insurmountable faith in the face of the insurmountable. This is essentially one of those so-called “texts of terror”. We struggle between its claim of impressive and authentic faith and out and out violence. You might dismiss the decapitation of Goliath as patriotic fiction or legend, but that takes the easy way out; for some reason, we have included this story (and other disturbing ones) in our sacred canon. That does not mean that God necessarily approved of it, of course. It was, though, part of the human culture of the time. Fanatical claims of knowing and understanding absolute truth. Blind obedience to totalitarian, charismatic, and authoritarian leaders or their views that undermines moral integrity, personal freedom, individual responsibility, and intellectual inquiry. Identifying and rationalizing “end times” scenarios in the name of your religion. Justifying religious ends by dubious means. Any and all forms of dehumanization, from openly declaring war on your enemy, demonizing those who differ from you, construing your neighbor as an Other, to claiming that God is on your side alone. Pressure tactics of coercion, deception, and false advertisement. Alienation, isolation and withdrawal from family, friends and society, whether psychologically or literally. Exploitation and all forms of unreasonable demands upon one’s time, money, resources, family, friendships, sexuality, etc. Perhaps the question that we need to ask ourselves, hard as it is to ask, is whether or not the way we live out our faith and our belief system is really a faith-filled and grace-filled way of being God’s love in the world. In other words, what does the way we live say about our understanding of God and the message that God has for all? The truth is, David wasn’t completely at fault. We can’t blame him totally. He was scared, scared that his very life and the way he lives it would be taken away. And he was, after all, defending God. (Hmmm…is that what we’re called to do? Does God really need defending?) But those five smooth stones were his way of doing that. He probably really believed, right or wrong, that he was doing what God called him to do and defending his faith against a huge obstacle, against a seemingly insurmountable challenge. Maybe the question that we should ask is what defending our faith actually does to our faith. Where is the line between what God calls us to do and what we think God calls us to do? Where is the line between who God calls us to be and who we envision ourselves to be? What can we bring to our own culture and society and world from it? What does the way we live say of God’s message in the world? In what ways does our way of “being” Christian not depict God’s message in the world? Are we called to defend God or defend our faith? What does that look like? This passage actually puts us in the middle of some complex communication. In other words, we’re sort of coming into the middle of it. This is toward the end of Paul’s argument describing and defending his and his coworkers’ ministry to the congregation at Corinth. Paul does not argue but instead comes at the issue from a number of different perspectives. He exhorts the Corinthians to view their ministry as embodying the work, if not the very being, of Christ and to act appropriately in response to the grace that they have received through Christ. Paul contends that accepting the grace of God for oneself corresponds to opening wide your hearts to those doing ministry. He asserts his and his coworkers’ legitimacy as ministers of Christ and at the same time shows their care for the community as beloved children of God. This also implies that good and legitimate ministry does not always mean success. That was not Christ’s story for ministry. This means that we cannot always measure authentic ministry in terms of numbers, enthusiasm, or dollars. These are possible outcomes but do not necessarily define authenticity or “success”. The Gospel is often explained in terms of blessings, a Gospel of Success. “Believe in Jesus and all your worries will fade away.” (Or believe in God and God will stand up for the little guy, in the case of the take on David and Goliath) And yet, many times, ones troubles multiply BECAUSE they are Christian. Jesus never promised that if we believe in him our life will by “joy, joy, joy”. No, the Christian walk is both glory and dishonor. There is a sense where our life is lived possessing everything, but having nothing. We will have to carry this tension with us always while in this “mortal frame.” Doing the splits is not easy, but it is how we must live life – one foot in heaven and one on earth. Paul tells his readers to “open wide” their hearts and to see that salvation is right in front of them. It cannot be measured. It just is. That is the Gospel and that is how we should live and model our behavior. What, then, is “fruitfulness” in ministry? What do you think most people think of when they hear the word “ministry”? How does the “Gospel of Success” get in our way as ministers of the Gospel? What would that mean to “open wide” our hearts to the salvation that is right in front of us? This passage comes immediately after Jesus’ telling of the Parable of the Sower. So after a long day of teaching the crowds, Jesus needs a break. He initiates a trip across the Sea of Galilee with the disciples and other boats, making a small entourage. 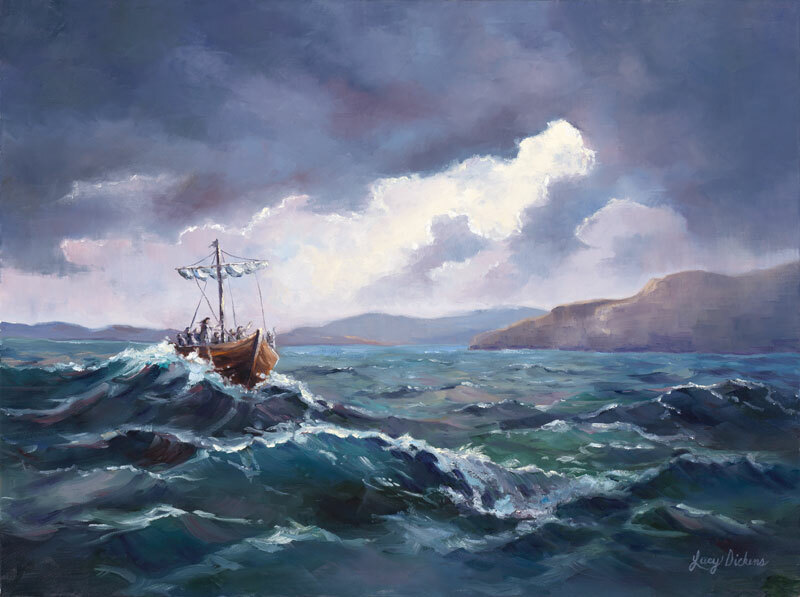 A great windstorm arises, so great that the waves crash against the boat and water begins to fill up the boat. Even the experienced fishermen in their midst could do nothing. So he got up and with a simple word, the storm subsided. And they floated for a few moments, not saying a word to each other, as the boat floated as if on glass. Then Jesus turned to them. “Have you no faith?” Well this was truly a little much. Who was this man that even the sea and the winds obey his voice? You’ll remember that in many ancient myths, the god of the sea is the god of chaos. We cannot control the water. So, as you can imagine, the disciples came to the sudden realization that no one other than God has the power to tame and order chaos. What is interesting is that Jesus suggests they go just as the sun was setting (darkness) and set off to the other side (the unknown) and while on the trip, a storm came about (peril). And through it all, Jesus rested, confident not only in God but in the disciples themselves. Now, our experience has been that Jesus does not usually do things that are not intentional. What does all this mean? God had entrusted the disciples with a faith. Jesus knew this. But, instead, the disciples let fear get in the way of trusting not only in God but in their own faith. I think we miss something if we reduce this story to pure wonder and miracles. We miss the journey of faith. It also can lead to what I think is just sort of bad theology. If God is only here to make storms and destruction disappear, then why Katrina? Why the recent earthquakes and tornadoes and devastating floods? Why are there difficulties at all in our lives? Because faith in God does not change the scenery. It shows us the way through it. We were never meant to stay safely and predictably in the harbor. Have faith in the faith that God puts in you to walk with God through all of life. The winds will still rage. The waves will fill our boat with water until we are sure that we will die. And the boat will rock until we can stand it no more. Emmet Fox said this: “Suppose your whole world seems to rock on its foundation. Hold on steadily and let it rock, and when the rocking is over, the picture will have reassembled itself into something much nearer to your heart’s desire.” For you see, my friends, this is life. And all that is life has God in its very being. We are not on the journey alone. God has given us unharbored faith and has faith in us that we will use it and come through the storm. As Jesus showed us, it is our faith in God and in the faith that God has in us that in the midst of the darkness, at the height of the storm, we will be able to breathe the words, “Peace! Be still!” Have faith in the faith that God has in you! How does this speak to you about your own faith? What does this say about our own life?